The author of this informative article had severe asthma himself as a child. This motivated Doctor Cibik to study the treatment of this condition from a Chinese and natural medicine point of view. Qigong is a wonderful modality that is perfect for control and improvement of many chronic conditions including asthma and allergies. As a life long asthmatic myself, I have taken exceptional interest in asthma and immunobiology and have made it my focus as a naturopathic doctor. With asthma afflicting over 20 million people in the United States alone, and with over 40,000,00 people suffering with allergies that can perpetrate into asthma, it is time that we look at alternative methods of dealing with this sometimes-fatal disease. I say fatal because over 5,000 people die each year from asthma attacks. Asthma diagnoses are escalating in this country with more and more children carrying inhalators of rescue medicine to school each year. I know this from working with the American Lung Association and the American Respiratory Alliance; two organizations dedicated to educating people on their options with this life-threatening disease. Classically they provide in-school education and asthma-camps sponsored by local hospitals to provide the latest breakthroughs and daily maintenance guidelines to children and parents as well as to friends of asthma. Traditionally I have worked with them to teach meditation techniques and relaxation techniques to children and adults with this condition, as even western medicine has noted the value of the relaxation response thanks to such innovative work by Herbert Benson, a cardiologist at Harvard University. Predominately I teach specific Taoist Qigong techniques as my introduction to this world of relaxation and deeper breathing. I use the term Asthma Qigong TM to designate this system for its consistency in presentation and techniques. The response by parents, teachers and healthcare workers has been tremendous, with interest increasing every year for the last ten years. Additionally is it wonderful for ancient eastern methods of treatment (Qigong) and western medicine to work side by side, mutually respecting and encouraging each other’s work. Why asthma is so deadly? Asthma can attack anywhere in any environment, not just dusty hallways or in the middle of spring as the tree pollen blooms, but at work, play and even sleeping. Hidden dangers like dust mites, the little creatures that fed on our own naturally shedding skin, live in our beds at night and allergic reaction to their feces can be a major contributor to nocturnal asthma attacks. Therefore, this apparent internal lack of control becomes the very catalyst, (anxiety) which then becomes a huge factor in the asthma exacerbation process. Learned helplessness has long been documented in western science as a cause of the fight of flight effect (stress or neuropeptide interference). Having an asthma attack is a frightening thing. Imagine running as fast as you can up 12 flights of stairs with your mouth and one nostril tapped shut! This is what an asthma attack feels like. You don’t know how to get your next breath of air and whether that will be enough to keep you from suffocating. Powerful emotions are elicited with the fear of suffocation, and with that huge amounts of neuropeptides are released in the body. Neuropeptides, as defined by Dr. Candace Pert, a former researcher at the National Institutes of Health, are the molecules of emotion that affect every system of the human body. Fear and hypoxia combined become a lethal combination, especially if one has forgotten their rescue medication (Albuterol for example). Asthma Qigong TM becomes a modality to give a person an anchoring system of internal control on this roller coaster ride of emotions. It helps stabilize the body not only in its breathing mechanics, but also by controlling neuropeptides eliciting emotions, specifically fear or anxiety. The reason Asthma Qigong TM is so effective comes from the understanding of the Wei chi fields and their relationship to defense from external or internal pathogenic factors. The Wei chi fields are kind of an invisible force field emanating from the body that allows our internal environment to interact with our external environment (allergy sensitivity for example). In Taoist Qigong, the three Wei chi fields link directly to the three Dan tiens or energetic orbs that make up the vessel of the body. These three Dan tiens correspond also to the physical, emotional and spiritual (mindfulness) aspect of man. This concept is a major thrust in the understanding of the inner alchemy of Taoist meditations and existence. The Taji pole pierces through the three Dan tiens and its major throughway for energetic transfer similar to a two-lane highway where energy can come in, and energy can go out. It becomes our “center” and our connection to the earth and to heaven, in other words balance or homeostasis. Balance is something desperately needed during an asthma attack, first by controlling the mind (Shen), the emotions (neuropeptides) and then the physical body (pH levels), hence the three Dan tiens. Asthma Qigong TM when practiced regularly becomes a modality to strengthen our resistance to external pathogenic factors to an otherwise sensitive individual, by strengthening the Wei chi fields. It allows us to balance the three Dan tiens and their attributes of mind, emotions and body and to become rooted to the earth but also connected to the Divine. What a wonderful peaceful way to maintain homeostasis! There are only two ways to control the Yin and Yang of pH or the internal milieu of the body, and that is by controlling post-natal Qi. Our food, water and breathing affect pH directly. When pH is too out of balance the body begins internal warfare to correct the problem before it becomes fatal. Asthma Qigong TM regulates the breath by exercise prescriptive movements based on factors such as the three Dan tiens or the five-element theory. minute, or one complete inhale/ exhale cycle every ten seconds. It is interesting to note that all chants regardless of dogma or culture, work on this 10-second premise of time through spacing of breath and words. Additionally, many osteopathic doctors using cranial sacral therapy also notice a rhythm of 6 to 12 cycles per minute between the pulse of the cranium and sacrum. 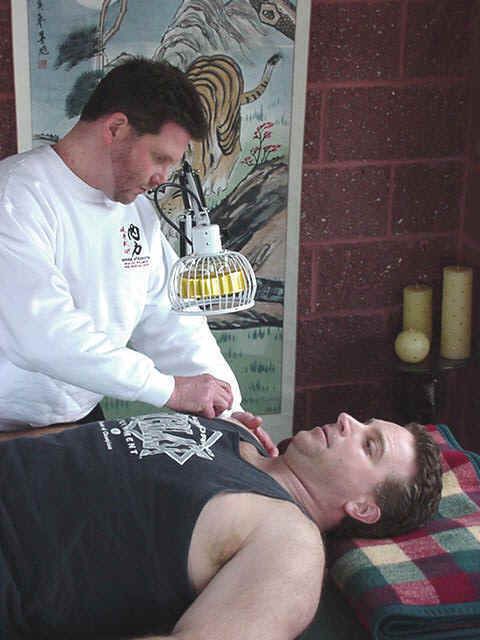 Asthma Qigong TM releases increased tetany via the combined action of breathwork and musculoskeletal movement that is both reforming but sustained and elongated; similar to strain / counterstrain movements done by massage and physical therapists. Asthma Qigong TM also uses specific tones or sounds to purge mucous from gathering in the chest. The Karolinska Institute in Stockholm Sweden recently discovered that simple humming and toning could open and ventilate the sinuses from mucous! Qigong practitioners have known about the purgative effects of vibrations for thousands of years, but confirmation of these ancient techniques allows more and more people the belief structure to try and benefit from them. Qigong exercises are one of the most powerful and integrated therapies man has yet devised for his own health and well-being. It does not take any equipment, is portable and can be performed anywhere. I encourage people to look to Qigong as an adjunct therapy at best when treating any known disease or ailment. Dr. Ted J. Cibik, ND, DMQ, HFI is Executive Director of Inner Strength, Inc.
Dr. Cibik is the United States Dean of Henan University of TCM (a teaching hospital found in Henan, China), and is Dean of Naturopathy and Psychoneurimmunology with the IIMQ as well as one of the founding members of the organization. He is board certified Naturopathic Doctor and one of only a few doctors of Medical Qigong (DMQ) in the United States. Visit him at www.inner-strength.com or www.inner-strength.org for Medical Qigong training.